Following the election, I quickly began to feel overwhelmed by the seemingly never-ending series of appalling, discouraging, frustrating, and frightening events that typify the current political and social situation. Thankfully, there are lots of resources that have mobilized to help focus resistance and provide individual citizens with ways to make their voices heard. But I needed a way to make an immediate, personal difference, something that would allow me to channel my frustration and feelings of powerlessness into something positive. I hoped to find a local cause. The universe provided when I learned about organizations that collect hand-knit scarves to give to victims of sexual assault when they leave the hospital. The idea is to give victims something of warmth and comfort to get them home in the immediate, and perhaps give them solace and strength in the longer term. Even if they never wear it, a hand-made scarf can serve as a symbol of support and compassion. I jumped on the idea. I love to knit because at the end of a project, you have something tangible, beautiful, and best of all, functional to show for it, and while I will never meet the individuals who receive these donated scarves, I’m content knowing each scarf will (hopefully) make a positive and immediate impact on someone’s life, even in this small way. And so, over this past holiday season, I purchased yarn and scouted for new patterns to try. 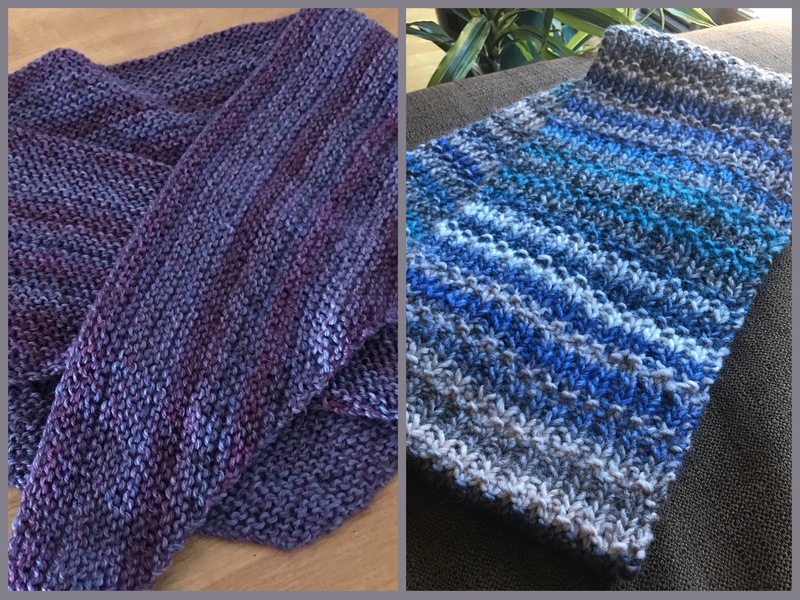 After I completed the first scarf, I hit a bump in the road when my repeated attempts to contact a well-known local organization met with no response. Once again the universe provided when a friend of mine attended an event at the Illinois Holocaust Museum that was part of the Women Hold Up Half the Sky exhibition. There she met someone who works as a crisis counselor for women in the ER, directly following an assault. During her volunteer shift, when this counselor receives a call, she heads to the hospital, where she advocates with the medical staff and law enforcement on behalf of the victim, providing support, counselling information, and items of clothing. Though I have many personal knitting projects queuing up, I’ll continue to make time to knit scarves to donate and each year, as the weather turns colder, I’ll hand them off to my counsellor friend, with the hope that at worst, each scarf will give comfort to someone at a terrible time, and at best, will never be needed at all.